The official cocktail of New Orleans as of 2008, the Sazerac Cocktail was made famous at the Sazerack Bar at the New Orleans Roosevelt Hotel. Herbsaint is an anise flavored liqueur invented in New Orleans back in the 1930s, when absinthe was banned. Rim an old fashioned glass with absinthe or Herbsaint. Twist the lemon peel to release the essential oils and add it to the rim of the glass. Add the whiskey, simple syrup and bitters to a cocktail shaker filled with ice chunks and stir or if you don't mind the froth, shake. Strain into the glass. Drop the peel into the glass if you like. 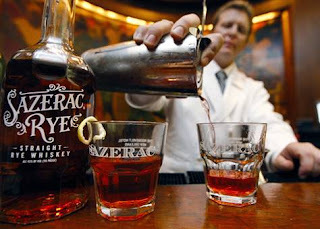 Variation: Substitute cognac for the rye whiskey, or use a mixture of cognac and whiskey. Do not, however, substitute bourbon for the rye whiskey - it is too sweet. Wild Turkey, Jim Bean, and Old Overholt, are a few brands of rye whiskey.